I was once the apprentice of being the most powerful in the galaxy. I was destined for something else. 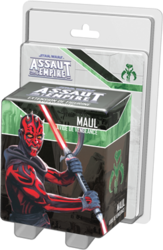 Introduce the power of hatred into your Assault on Empire games with Maul, Avide of Vengeance. The "Old Sith" Project card series provides the Imperial Player with new options that will fit into any campaign. This expansion also contains new Command Cards and a single Skirmish mission to play one on one. Be careful this game is an extension of Star Wars: Assaut sur l'Empire ... + 1 more+ 1 more and cannot be played alone. To be able to play it you must have a copy of the game Star Wars: Assaut sur l'Empire ... + 1 more+ 1 more.